Pool 101 - Which Pool Filter do you have? If you do not see your filter in the upcoming photographs, keep in mind that there have been a variety of filters developed over the past 30 years and it is impossible to show them all. More than likely you have a cartridge system, as they are the most common in the industry. They are simple to service, sturdy, durable and reliable. 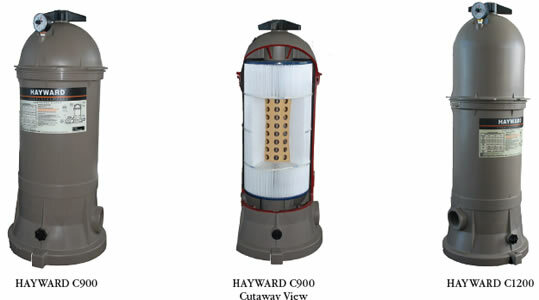 The most popular are manufactured by HAYWARD. Over the years, I have kept a sharp eye on this brand and have been surprised at how few problems they have given me. 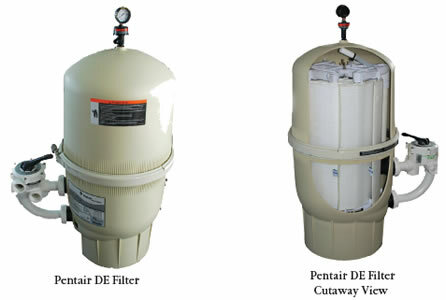 The following filter systems are current standards in the industry. Sand Filters - One of the oldest and most popular methods of water filtration, impurities are extracted from the water using sand to collect and attract the debris. 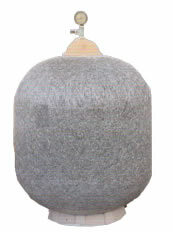 The sand bed inside the filter removes larger particles and as the bed loads with debris, the filter removes finer particles. 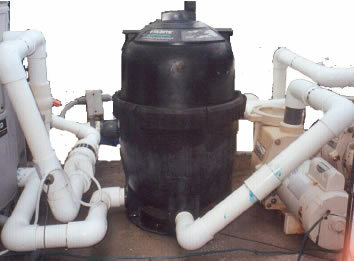 Sand filters trap debris as small as 20 to 40 microns. Cartridge Filters - Cartridge filters - Cover a greater surface area than sand filters, allowing for fewer clogs and easier maintenance. Cartridge filters are designed to run at lower pressure than sand filters which puts less back pressure on the pump, providing more flow and turnover. Cartridge filter elements trap debris as small as 10 to 15 microns. DE Filters - A very simple process, a DE filter system offers an extremely advanced system of filtering the water in your pool. They have internal elements that are coated with DE powder that strains dirt, dust and algae from the water. This powder is applied through the pool skimmer after a backwash or cleaning in order to restore proper filtration and has microscopic openings that look like tiny sponges. Water passes through these openings and small microscopic particles are trapped when they pass through the system. DE filters trap debris as small as 2 - 5 microns. Under the cartridge filter is a 2” hole that allows water to flow into the filter that fits into a matching hole in the bottom of the housing. If it is not in proper position, you will never get the lid on. The top of the housing should fit snugly on the bottom portion of the housing, if there are any gaps between the two, or, if it is sitting crooked, you will never get the outer lock ring on. Lubricate O-ring on upper portion of housing. The top should go on easily until the lock ring clicks in place. While turning lock ring, if you get the feeling that it is not going on properly, trust your instincts, take it off, and check to see if top and bottom pieces are together properly. If this gets on crooked, you will have all kinds of problems getting it back off!